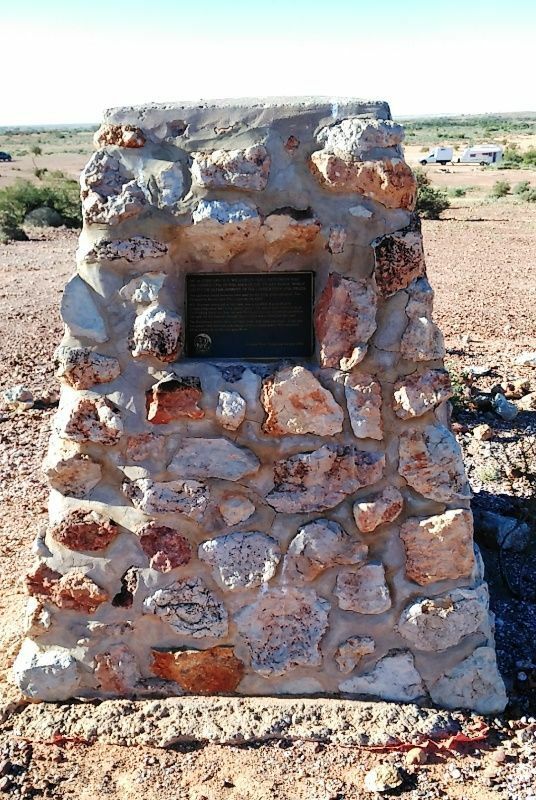 Monument commemorates the discovery of opal by Will Hutchison in 1915. 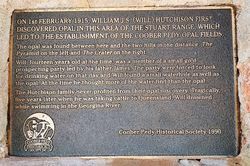 In January 1915, the New Colorado Prospecting Syndicate, consisting of Jim Hutchison and his 14 year old son William, PJ Winch and M McKenzie had unsuccessfully been searching for gold south of Coober Pedy. The men had set up camp and were searching for water when young Willie found pieces of opal on the surface of the ground. This was on the 1st February 1915 and 8 days later the first opal claim was pegged. 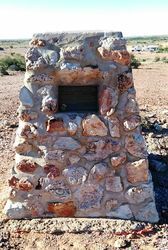 Coober Pedy was originally known as the Stuart Range Opal Field, named after John McDouall Stuart, who in 1858 was the first European explorer in the area. In 1920 it was re-named Coober Pedy, an anglicised version of Aboriginal words "kupa piti", commonly assumed to mean "white man in a hole". ON 1st FEBRUARY 1915, WILLIAM (J.S.) WILL HUTCHISON FIRST DISCOVERED OPAL IN THIS AREA OF THE STUART RANGE, WHICH LED TO THE ESTABLISHMENT OF THE COOBER PEDY OPAL FIELDS. The opal was found between here and the two hills in the distance: The Pyramid on the left and The Crater on the right. Will, fourteen years old at the time, was a member of a small gold prospecting party led by his father James. The party were forced to look for drinking water on that day and Will found a small waterhole as well as the opal. The Hutchison family never profited from their opal discovery. Tragically, five years later while he was taking cattle to Queensland, Will drowned while swimming in the Georgina River.